Why Is the Bay Area Building a Suicide Barrier? It takes four seconds to fall the 220 feet from the Golden Gate Bridge to the waters of the San Francisco Bay below. In that brief instant, a falling body can reach speeds of 75 m.p.h. The impact is almost always fatal. Just three months after the bridge opened in 1937, a man jumped. Two years later, the California Highway Patrol officially asked the Golden Gate Bridge District to do something to stop the suicides. Now, more than 70 years later, that request is finally close to being fulfilled. Each year, this iconic reddish-orange bridge sees an average of 30 people jump off it  a sad statistic that has made the structure the most popular place to commit suicide in the world. Over the years, some 1,300 people in total have taken the plunge. Yet, to this day, only a 4-ft. railing separates pedestrians from the depths of San Francisco Bay. 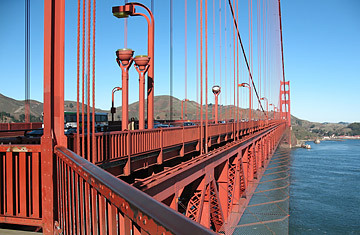 Security cameras, bike patrols and hotline phones placed along the Golden Gate may prevent as many as 70% of those contemplating suicide from making the leap, but there is no physical barrier to prevent a jump  as opposed to other suicide magnets of years past like the Eiffel Tower and the Empire State Building that have barriers in place. Finally, though, in a long-awaited victory for suicide-prevention advocates, the Bay Area's transportation committee voted July 28 to appropriate $5 million in federal funds to engineer and design a suicide barrier: a stainless-steel net, which will hang 20 ft. below the bridge to catch and cocoon jumpers in midair. Every 10 years or so, momentum grows to install such a barrier, says Paul Muller, a board member of the Bridge Rail Foundation, which seeks to improve pedestrian safety on the bridge. "These are folks in our community whose lives matter," he says. "We're finally getting the point across that there is an opportunity here to prevent these deaths." This time around, the efforts were spurred by the release of the The Bridge, a 2006 documentary. Director Eric Steel and his crew spent a year shooting the bridge in 2004. They caught about two dozen people taking the fatal plunge on film. "As soon as I started this project I thought in my heart the right thing to do was to put up a barrier," Steel says. "It was just senseless that people were able to jump when they could be stopped." He says every time he showed his film at a film festival, the first question from the audience was always, "Why isn't there a barrier?" Much of the resistance comes from local purists who don't want to change a thing about the famous overpass connecting San Francisco and Marin counties. "Local citizens are very vocal about their love of the bridge and they don't want it altered," says Mary Currie, spokeswoman for the Golden Gate Bridge, Highway and Transportation District. In fact, the vistas of San Francisco's skyline are the reason the current railing is so short. The original architect called for a higher rail, but the builder was a short man and insisted on lowering the bar so his view of the bay would not be obstructed. But tell that to John Brooks, whose 17-year-old daughter Casey jumped from the bridge in January 2008. "What they're saying is they're putting aesthetics ahead of saving lives," he says. "That's pretty heartless." Still, it's an argument that had a lot of traction in the area. Some of the proposed designs for a barrier would have added cage-like eyesores to the elegant Golden Gate. One called for a 10-ft. wall of cables that would curve back toward the roadway at the top. Albert Boro, mayor of San Rafael in Marin County and president of the board that approved the new design, says the net is the first design they've seen that is a compromise. "This particular design does two things: it protects the integrity and beauty of the bridge, while at the same time prevents people from committing suicide," Boro says. A similar net system is in place at the Münster cathedral in Bern, Switzerland, which previously saw an average of 25 suicides each year. Since installing the net in 1998 that number has fallen to zero. Ken Holmes, who as the coroner for Marin County has worked with hundreds of families of people who committed suicide off the bridge, claims a net is an obvious deterrent that will save countless lives. "The bridge offers very easy access to a very lethal means," he says. "The thing about these people is they don't think about guns, knives or pills  they think about throwing their lives away. If they are prevented from doing that, statistically, they never go and try it again in any other form." But while there may be a new consensus for a suicide barrier in the Bay Area, it will likely take years to raise the funds necessary  an estimated $45 million  to begin construction. In the meantime, as the years tick by, the Golden Gate stands as a shimmering siren for those who seek a tragic end. See TIME's City Guide for San Francisco. See pictures of San Francisco.